Magnets, man. They make you go fast. Major Magnet looks like Sonic a little, even though Sonic is a hedgehog and Magnet's protagonist is a pudgy, big-nosed hero. Major Magnet kind of sounds like Sonic at times, too. As far as I can tell, these similarities are intentional—but, unlike Sonic, Major Magnet is an iOS platformer that revolves around magnets. 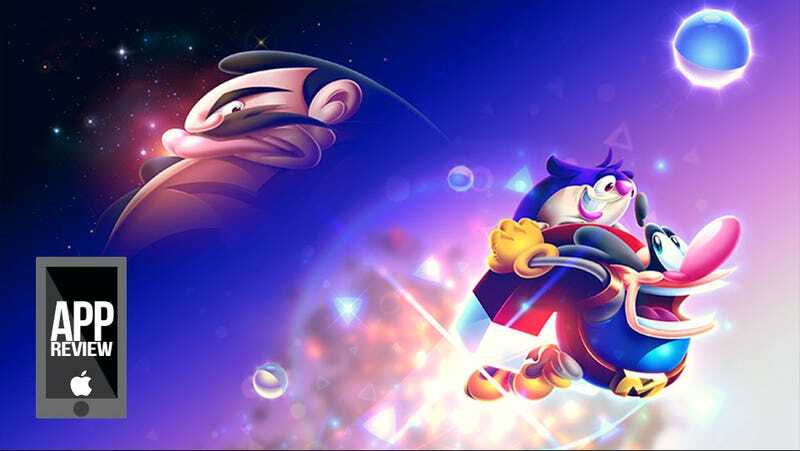 The game starts out with Marv, the protagonist, losing his cape. Obviously this means he has to resort to using a giant magnet. You move him around by tapping on other magnets around the level, which he'll stick to provided he's within range. While I found that the game is forgiving when it comes to range, that's not a negative. Not when magnets are your primary means of movement! The alternative is dying a whole lot because you messed up, which doesn't sound fun. You can also swipe the screen to rocket the Major wherever you'd like, giving the core gameplay a bit of complexity. Sometimes the game requires you to swipe to get somewhere specific, but honestly, most of the time I used the mechanic it was to save myself. Turns out, picking the best trajectory to launch yourself in can be tricky, though you'll get better as it as you go along. The core gameplay—catapulting yourself to and fro using magnetism—is basic enough, and the game could have easily revolved around that. Thankfully, there is the added challenge of different magnet types (like ones that set off timed switches, or moving magnets) along with different types of environmental things to take under consideration. It's a game that knows how to take something simple and keep it interesting. Those looking for a challenge will look toward collecting "bakes," which require you to be more flexible and precise with your movement. Where getting to the end of the level normally is often a straightforward affair, figuring out how to collect a level's bake will require more effort and expert maneuvering. The game moves at a frenetic pace, requiring you to react fast to make sure the Major doesn't fall off the level or run into danger. The obvious influences and fast pace might make this sound like soulless aping, but to me much of Major Magnet felt like a modern reimagining of Sonic; what Sonic might've looked like were it invented today, in 2013, for touch devices. That alone makes Major Magnet worth experiencing.